Torn from his mother, sold to a backyard slaughterer, Theodore is lucky he made a break for freedom into a neighbor's backyard. Now, he is safe but he needs your help to grow up strong. Theodore is alive because someone cared enough to make one phone call. The young calf was being raised illegally for eventual slaughter in an urban neighborhood of Sacramento. When the calf busted through a fence into a neighbor's yard, instead of returning the calf, the neighbor made the best decision and called animal control. And when we received the call, we had to help. Our staff drove immediately to the dog and cat shelter, picking up the calf. His poop-encrusted tail told us he had not been fed properly and needed immediate care. Theodore was born on a small dairy farm. 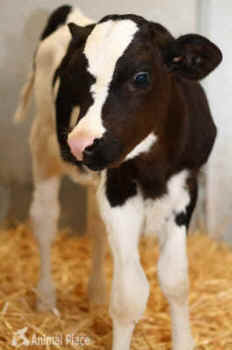 Like all male calves, he was taken from his mom moments after birth and shoved into a pen by himself. His cries went unheeded as his mom was forced into another cycle of pregnancy and milking. Male calves are the trash of the dairy industry and are often sold to be slaughtered for veal or cheap dairy beef. They never nurse from their mom or frolick with other calves. They live solitary lives until brutally slaughtered. Go dairy-free! Calves are always removed from their moms immediately after birth, regardless of the farm's size. Do your part and choose soy or nut milk in your cereal or coconut creamer in your coffee. Check out the natural food aisle of your grocery store to find tasty dairy alternatives! Report cruelty or neglect! The rise in urban animal farming is a distressing trend, since few urbanites take the time to research the laws or proper care of farmed animals. We carefully screen adopters through our Rescue Ranch program to make sure they can provide proper and legal care to farmed animals. If you see a farm animal in need or distress, take photos and immediately call your local animal control agency to file a welfare check.